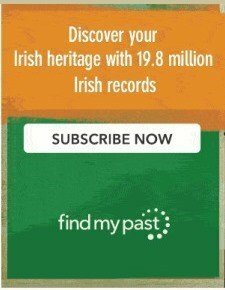 Free Irish genealogy websites. The 10 best free sites for Irish family history. The free Irish genealogy websites and databases detailed in my list are my personal, and completely independent, selection of sites for family history research. These are the genealogy databases that I have found most useful in my own research and which I confidently recommend. Although these sites, which are listed below, are reasonably easy to use, the navigation or layout of such big genealogy databases 'improves' with familiarity. So you might do best to try to find out how the site works BEFORE you start hitting the Search button. Each of these sites provides fabulously useful information and some even provide free access to data for which other sites charge. Hard to believe, but it often happens. Not only do these sites provide free Irish genealogy info, you don't have to supply personal details or register with them. So they're free in every sense. Enjoy! One of a new generation of free Irish genealogy resources to have come online in the last few years, Ask about ireland brings the indexes, full returns and maps of Richard Griffith's Primary Valuation of Tenements to your computer screen free of charge. The Valuation, as it is usually known, is one of the most important surviving 19th-century genealogical sources and plays a part in nearly everyone's Irish ancestry research as it records the names of householders in each county at the time this island-wide land survey was carried out. More about Griffith's Valuation here. The Ask About Ireland site has improved considerably since its initial launch and it now among the most popular free Irish genealogy resources available. From 1892 to 1954, over twelve million immigrants entered the United States through Ellis Island, a small island in New York Harbor. Many of them were from Ireland. If your ancestors left Ireland before, during or shortly after the Great Hunger (1846-1849), you won't find them on the Ellis Island Passenger Database. 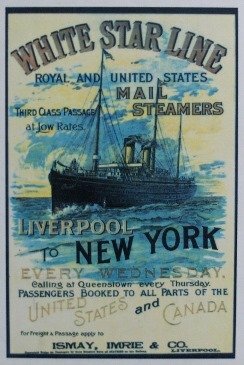 But if they set sail in one of the subsequent waves of emigration, you may be lucky to find their details among the passenger manifestos displayed on this site. Those details show the address where the immigrant was headed and, sometimes even more importantly, they will usually record the traveller's place of origin in Ireland. Although Failte Romhat is a personal site, containing family history information about the publisher's ancestors, it also carries quite a few searchable databases and other useful resources. Among these are Slater's Commercial Directory of Ireland 1846, the Flax Growers' List 1796 (a.k.a. the Spinning Wheel Entitlement List), and the Landowners List of 1876 which contains the names of landowners in ireland with more than one acre of land. A searchable Householders' Name Index to Griffith's Valuation is also available. This free Irish genealogy website also has many links to resources of particular interest to any family historian with links to Co. Cork. A regular winner of worldwide polls for Best Genealogy Websites, Family Search is run by the Church of Jesus Christ of Latter-day Saints (Mormons) and contains a huge and freely searchable archive of family history collections. Among its data are 1880/1881 census records for the US, UK and Canada, which can be extremely useful for those seeking family who had left Ireland by that date. But perhaps the most important free Irish genealogy resource is the searchable civil registration index. This includes births, marriages and deaths for the entire island from 1864 (1845 for non-Catholic marriages) to 1921. From 1922 to 1958 inclusive, it covers only the Republic of Ireland. Find out more about the indexes, and how to use them to obtain birth, marriage and death certificates, on my Irish Civil Registration page. All the collections available free on the National Archives of Ireland's Genealogy database (see below) are also available free on FamilySearch. A useful collection is the 1619-1898 Ireland Marriages Index; it holds nearly half a million entries gathered from different sources. Geographical coverage is patchy, but you may be lucky. Images of the Registry of Deeds memorials and various indexes were released online in 2016, and images of the Valuation Revision Books for the Republic are expected soon. These are unindexed but can be used if you are researching known names and residences. Genuki (an abbreviation for Genealogy UK and Ireland) is another exceptionally useful and free Irish genealogy resource, providing links to hundreds of sites that will be useful in your ancestry research. Its aim is to serve as a virtual genealogical reference library and most of the information is provides relates to primary historical material. On its pages you'll find all sorts of websites listed, most of them tightly targetted ie the sites of archives and local libraries, sites confirming the availability and location of church records, sites dedicated to specific surname interests, historical events, locations etc. The database can be entered from an All-Ireland page before proceeding to individual county pages. To act as a portal to most of the state-run genealogy records via one simple search mechanism. This can be especially useful for those new to Irish genealogy who may not otherwise discover some of the collections available. It delivers a rather ploddy user experience, however. To gather Irish church register records and present them in a free to access database. It performs this function brilliantly, but so far only for Church of Ireland registers from some parts of counties Kerry, Dublin City and Carlow, Presbyterian records for Dublin City, and RC records from counties Kerry, Cork and Dublin City. If you have ancestors of these denominations from the relevant area, consider yourself blessed! To provide access to a state-sanctioned version – the one used by General Register Office staff – of the Irish civil registration indexes. It's known as the 'enhanced' version, because it includes maiden names of mothers from 1900 and presents post-1870 marriages with the names of both bride and groom together. However, this version makes available only the 'historical records' ie births up to 100 years ago, marriages up to 75 years ago, and deaths up to 50 years ago. Images of the bmd certificates are available to download for all births from 1864 to the 100-year cut-off, for all marriages from 1870 to the 75-year cut-off, and for all deaths from 1878 to the 50-year cut off. The missing images are expected to be online by the end of 2018 / early 2019. The most popular resources on the National Archives of Ireland's dedicated Genealogy site are the fully digitised 1901 and 1911 census returns. In addition to a searchable index, you can downland images of the census returns, including the household returns and the enumerator's returns. (For details of what information the different returns contain, see my pages: the 1901 census and the 1911 census). Other resources freely available are the Tithe Applotment Books. This collection dates back to the 1820s but not everyone will find records of their ancestors; find out more about the TABs here, before you search the records. The site also holds a collection of World War One Soldiers' Wills, the calendars of Wills and Administration 1858–1922, Census Search Forms, the 1821-1851 'Census Fragments' and more. On 8 July 2015, the National Library of Ireland released a new database holding images of the Library's Roman Catholic parish registers microfilm collection. 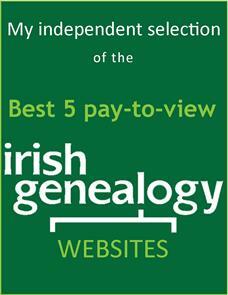 The site is easy to use and free, and Irish genealogy research will never be quite the same again! Having said that, it will not help every family historian with Irish Catholic ancestors. The main obstacle is that the Nimages have been released without an index, so you need to have a good idea of which parishes to research to have any chance of finding your family. However, since the images went online, the NLI's collection has been indexed by both Ancestry (fee) and FindMyPast (free). So far, so good. But some researchers will be disappointed by the availability of surviving records. While the cut-off date for all the records is 1880/1, the start date depends on when the parish started keeping records and how well they were stored. Some start from the 1740s, others start 100+ years later. So, for example, the Library's baptism and marriage records for Killian parish in Co. Galway date back to 1804. For the parish of Clarenbridge in the same county, baptism records start only in 1854 while marriage records start from 1837. This means that a researcher looking for a Catholic ancestor born in 1810 in Killian should find a baptism record, but if that same ancestor were from Clarenbridge, there would be no surviving record of the event. More about Roman Catholic baptism, marriage and burial records. 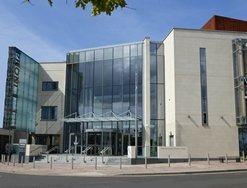 Established in 1923 following the partition of the island into the Republic of Ireland and Northern Ireland, the Public Record Office of Northern Ireland (PRONI) is the official repository for public records for the six counties of Antrim, Armagh, Derry-Londonderry, Down, Fermanagh and Tyrone. This free Irish genealogy and history site offers databases containing details of those who signed the Ulster Covenant (1912), records of pre-1840 Freeholders, and the first phase of the Will calenders (1858-1900) project. In March 2013, these collections were joined by the Revision Books of Griffith's Valuation (more about the Revision Books). You can also download several very useful advice guides specific to Northern Ireland research such as National School Records. Of course, the site also includes details of which microfilms or paper records are available for viewing at PRONI for each church and for which years. This Townlands database is a revised version of the well-known 'Sean Ruad' IreAtlas database. It holds details of all 60,000+ townlands as they appeared in the Index of Townlands, which was used for the 1851 census. It details the name of the County, Barony, Civil Parish, Poor Law Union and Province for each location. It's hosted on the website of Shane Wilson (along with many useful and free family history finding aids, especially for those researching ancestors from Dublin). It's an important – and free – Irish genealogy database because it helps you to find the various jurisdictions in which any given Irish townland is located. Since each jurisdiction keeps different kinds of records useful to genealogical study, it is critical to know the jurisdictions which covered your ancestor's birthplace or home. An alternative Townlands database to consult is held on IrishAncestors.ie the website of the Irish Genealogical Research Society. This Townland database is based on the Index of Townlands used for the 1901 census. As well as including the Province, County, Barony, Poor Law Union and Civil Parish, it offers the DED – the District Electoral Division. This is a very useful extra when searching the 1901 and 1911 censuses. Irish Genealogy News is my blog. 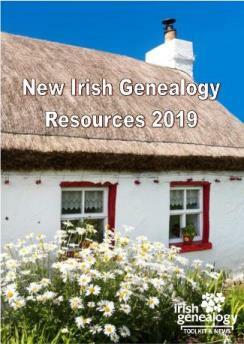 It's read by professional genealogists, individual family historians and pretty much everyone who wants to keep up to date with all the latest resources and developments in Irish family history. In his Irish Times column (July 2013), renowned genealogist John Grenham described Irish Genealogy News as 'absolutely essential for anyone who wants to know what’s happening in Irish genealogy'. Click/tap to find out more. Did all the records burn? The short answer is No, but the truth is a bit more complicated, because much of Ireland's genealogical heritage did, indeed, go up in flames at the Public Records Office in 1922. Discover which records burned, and which survived, and how this may impact your Irish family history research. Check out my exclusive range of FREE family tree templates. Most can be filled in on screen and then printed, ready for framing. After nearly ten years online, Irish Genealogy Toolkit is undergoing a facelift. The process may take some time as there are 184 pages to convert, so please bear with me during the transition. I hope you like the fresh new design and will quickly become accustomed to the revised layout. Written by the creator of Irish Genealogy Toolkit and Irish Genealogy News, The Family Tree Irish Genealogy Guide is full of advice, tips and strategies to ease what can be a challenging journey. Its guidance will be useful to any researcher of irish heritage, but especially for the target Irish-American researcher who's struggling to work back to Ireland from their immigrant ancestor. It's currently on sale with a 30% discount from the publisher's online store. Click/tap image.